Ki Mobility's flagship product, the Catalyst 5, is your best choice in ultra-lightweight mobility. 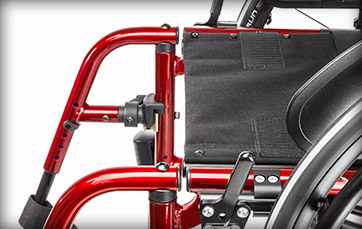 A high-performance, extremely light weight, folding wheelchair that has our largest selection of options. A reimbursement friendly K0005 that is light weight, durable and has the options you need to achieve the best possible fit. The performance you can expect from a Catalyst in a reimbursement friendly package. The state-of-the-art Catalyst 5 wheelchair in Titanium! Using Ti3AL/2.5V titanium alloy the CAT 5 Ti is incredibly lightweight, scratch resistant and durable. When every ounce matters this is the folding chair for you. The "Best-In-Class" K0004 chair on the market today. The Catalyst 4 is our entry level chair with the lowest base price available in the Catalyst family. The "Best-In-Class" K0004 chair on the market today. With a 24lb. weight this K0004 is easier to push and transport than its competitors. The Catalyst 4C has more option availability than its sister product the Catalyst 4. Catalyst frames are constructed from 7000 series aluminum. A stronger and lighter vibration dampening alloy that contributes to the Catalysts superior durability and high quality construction. Whether you are in the market for a K0004 or K0005 you can always count on quality construction when choosing a Catalyst. We pride ourselves in providing the highest quality manual wheelchairs to the Complex Rehab Industry. It is important to continuously improve upon our chairs and options selection to ensure we are maintaining our Better by Design standard. 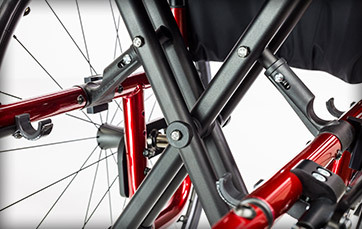 A few of our most recent enhancements to the Catalyst line include: our new cross brace design for increased rigidity and durability, black fasteners for aesthetics, cambering one-arm drive system, reclining backrest option and Performance Caster Housing to give you up to 4" of seat dump. Seat depth is an important function of every chair. It promotes proper seating position and can help with pressure reduction. So many manufacturers use the seat upholstery to measure the seat depth, leaving excess front frame protrusion. 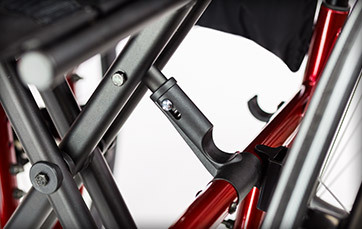 Ki Mobility matches the frame depth to our seat depth, on every chair. This results in a lighter chair, improved turning radius, easier transportation, storage, and a better result for the client. 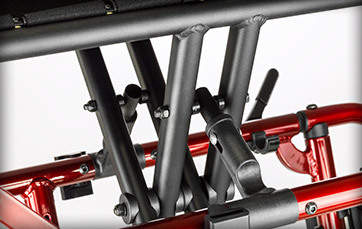 The Dual Interlocking Cross Brace design creates a frame that locks together to minimize the unwanted movement, or "front to back" racking, while redistributing loads onto components that can better manage forces. What this means to you is that no matter how much you use your Catalyst, the frame will remain as solid as it was the day you got it. 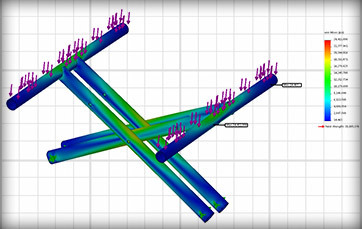 On typical above-the-rails designs all of the forces from the ground up, into the chair, and from the user down, through the chair, are transferred into the cross braces. In order to effectively deal with these loads other manufacturers design heavy cross-braces. The Catalyst's unique "between-the-rails" design transfers these loads from the cross brace to the vertical side frames. The geometry of the side frames allows them to support far greater loads. The Catalyst's patented Power X-Hinge revolutionizes how the cross brace folds within the frame by acting as an extensible link that expands and contracts when the frame folds and unfolds. This patented device allows for a unique geometrical frame design that is more structurally sound than other designs while also making it much easier to fold and unfold, every single time. 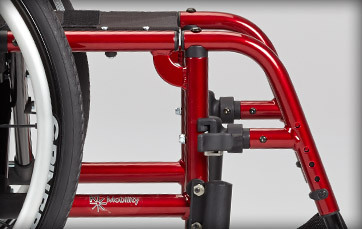 Other wheelchairs rely on the tension of the seat sling to solidify their frame when opened. However after a few months the upholstery experiences a natural stretching and your chair is "loosey goosey". 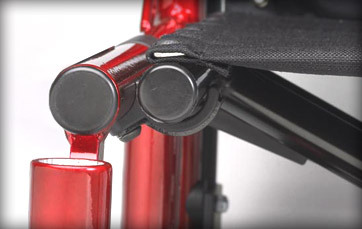 The Power X-hinge eliminates the need for the seat sling to be a structural part of your frame. A Catalyst is solid even without upholstery. This ensures a more rigid and responsive ride. 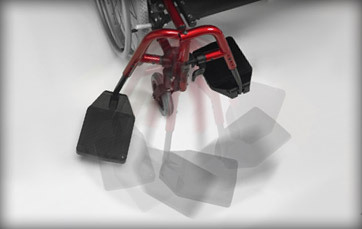 Enjoy the simplicity and strength of Catalyst's patented swing-away footrest hangers. The most intuitive hanger on the market allows you to attach and detach from any angle by simply pulling up or pushing down. It doesn't get any easier than this. The tapered engagement keeps the footrests snug and rattle free. Ki Mobility is the only manufacturer to offer a Lifetime Warranty** on the front hangers. Available in 60, 70, 80 and 90°. The tapered, noise free, no-rattle design of the height adjustable armrest produces a rock solid feel that is functional, light weight and easy to use. Like many of the options and accessories on Catalyst these were designed to be durable and user friendly. This is just one of many armrest options available. 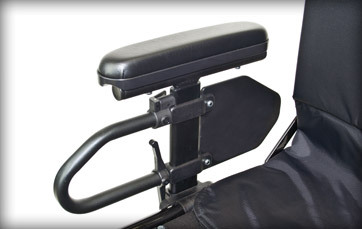 Visit the specific product pages to view all available armrest options.